On the 13th August we attended Hyson Green Festival, a local cultural festival that brings together communities to celebrate diversity and promote community cohesion. The festival was very popular this year, with people engaging with the wide range of activities that was available on the day: live music from artists such as Will Kapurura, Charlotte Brailsford and Roma Community Band. world food, henna, face painting, arts and craft stalls and a Health Corner hosted by Patty Dumplin. 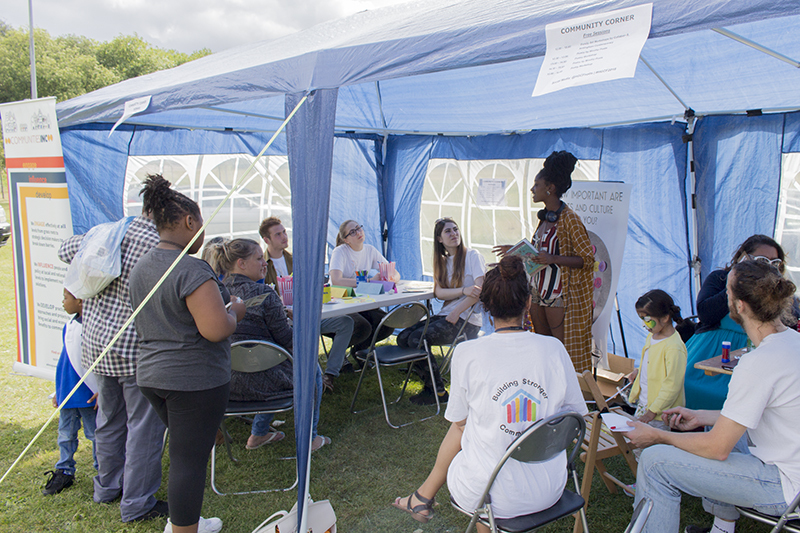 Our Community Corner was a real success,bringing together local organisations and groups to deliver free activities and workshops. Collabor-8, Nottingham Contemporary’s young people’s group run a family workshop targeted at all ages which focused on both the importance of art and culture and on exploring the idea of a community. Katie Roberts and Grace Bernard, members of Mouthy Poets, performed poetry sets while our own Helen Wheeler run free collaborative Poetry Workshops, where participants were invited to explore the answer to “What does a community mean to you?. Our community corner also hosted the women from the Rainbow Project Women’s Group, who sold their hand knitted goodies and gave the public tips on how to get involved with the Rainbow Project and on how to improve their knitting skills. The Hyson Green Festival was a great opportunity for us to promote our Building Stronger Communities project and engage diverse communities in our present and future activities. To see more from the day, scroll down for a photo gallery or watch a short video at this link.